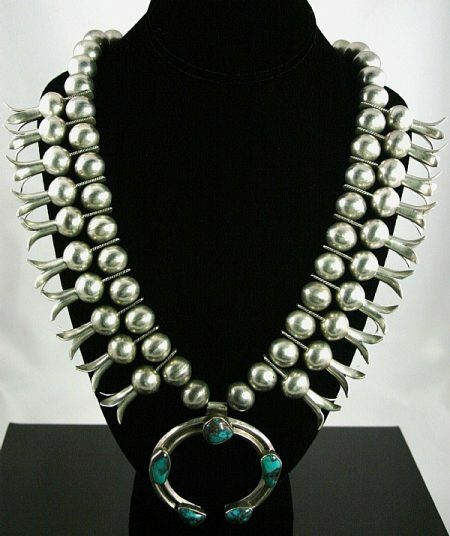 This old ceremonial necklace was made in Santo Domingo pueblo in the 1930s. It is made of hand drilled and hand ground oyster shell. 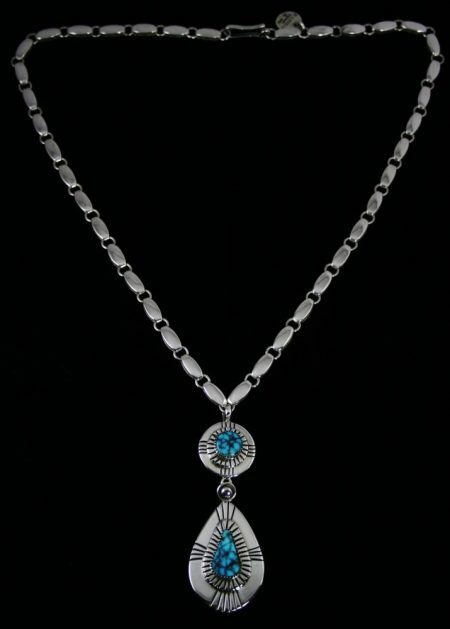 The necklace features an inlayed pendant. The pendant is inlayed on a fragment of an LP record. The inlay is natural turquoise, oyster shell and coral. 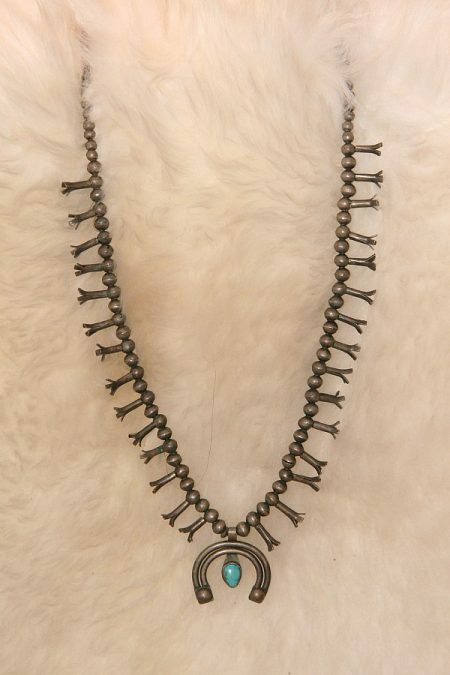 On each side of the necklace are four old Navajo handmade beads, each interspersed with three old squash blossoms. 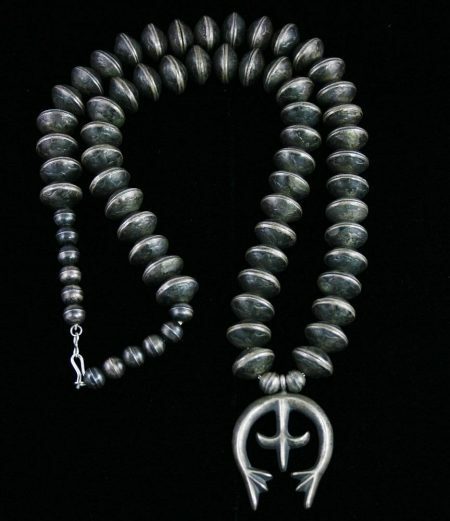 The sterling beads and blossoms came from an old Navajo squash style necklace. 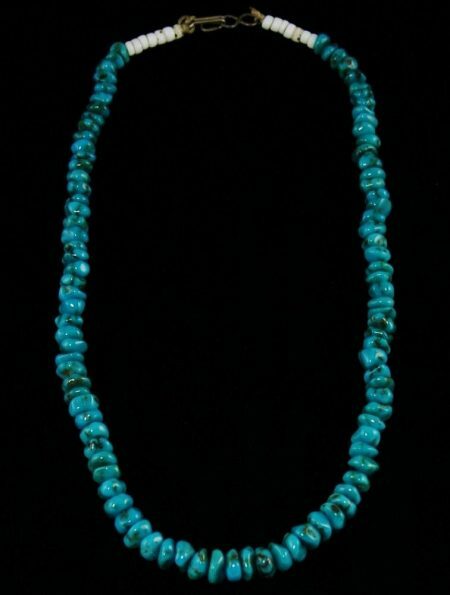 This 1930-40 natural hand ground and hand drilled turquoise necklace is finished by the attached inlayed shell pendant. The pendant is inlayed with natural turquoise old black lp record fragments, white shell and spiny oyster. The piece was made in Santo Domingo pueblo in New Mexico. It was worn at dance ceremonies over many years. 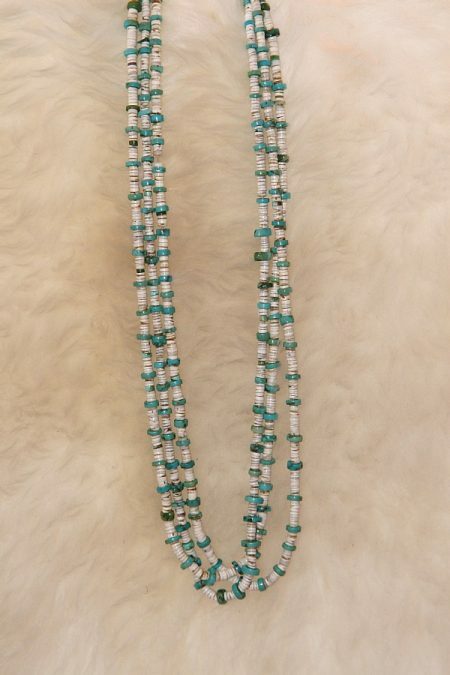 This necklace has nine natural high grade Blue Gem turquoise cabochons that are hand cut and hand drilled strung with small sterling beads interspersed with long hand made sterling beads. 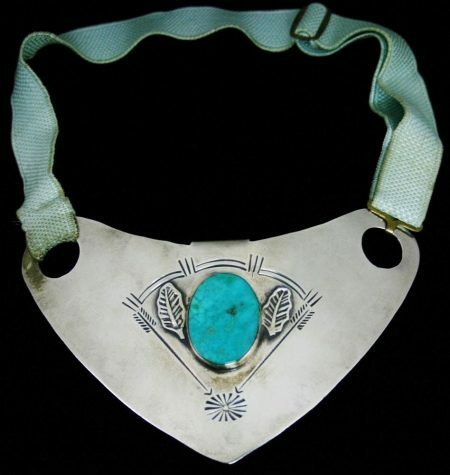 Probably made in Santo Domingo Pueblo, the necklace dates from the 1940s. 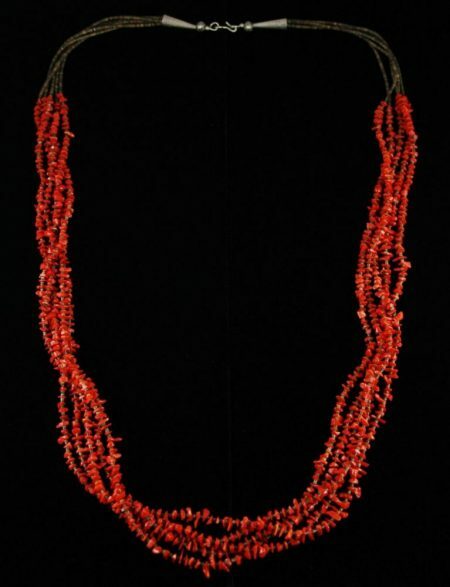 This wonderful old Navajo squash blossom necklace was collected at the Charles Eagleplume gallery in Estes Park Colorado in the early 1960s. It features nineteen large handmade sterling silver beads interspersed with ten perfectly matched handmade sterling silver squash blossoms. 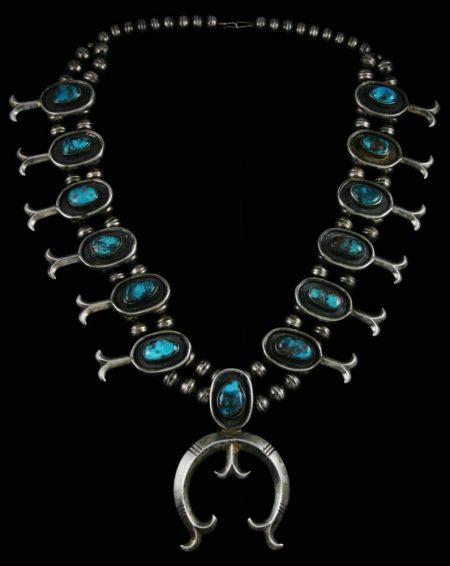 The naja is made from hand pulled ingot sterling silver and set with five rare gem grade natural smoky Bisbee cabochons. 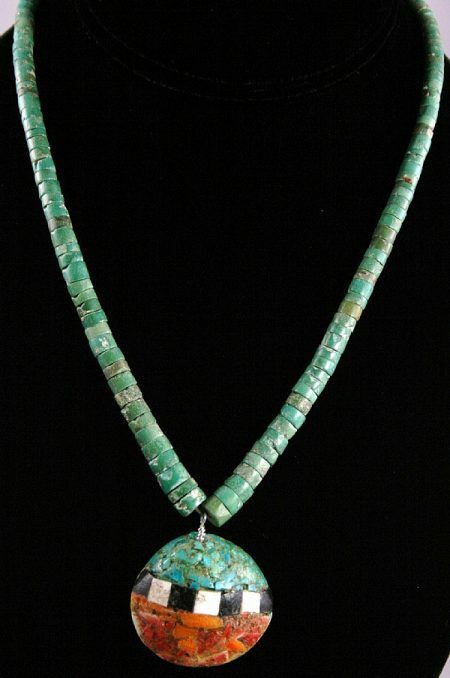 The necklace was marked as old when purchased and probably dates from the 1950s. 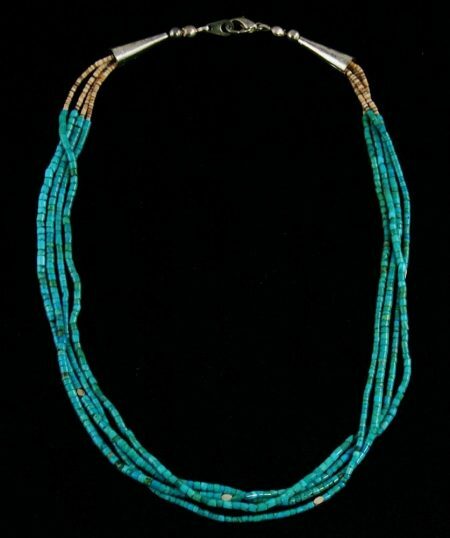 This old ceremonial necklace made in the 1930-40s is hand drilled and hand ground out of natural turquoise and oyster shell. 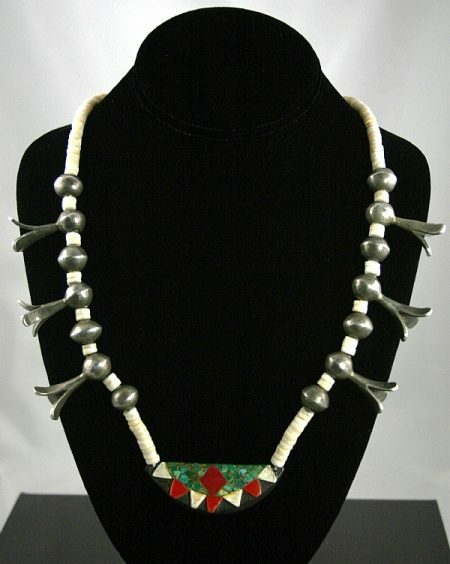 The necklace was made to be worn at the dances and features a large oyster shell pendant at its bottom. This circa 1940-50's Navajo box bow squash is set with thirty one natural Persian turquoise domed cabochons hand cut in Persia (present day Iran). 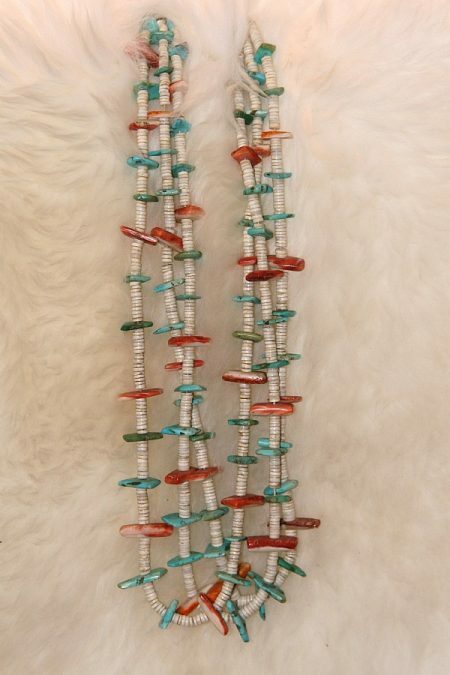 The squash blossom necklace is strung on hand made sterling silver beads. The stones are surrounded by a hand stamped box with a small Naja soldered beneath. The Naja is stamped to match. 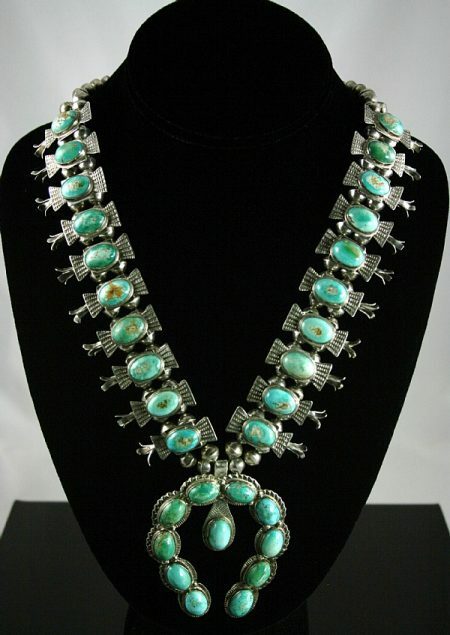 Incredible circa 1930 gem grade Royston turquoise necklace. 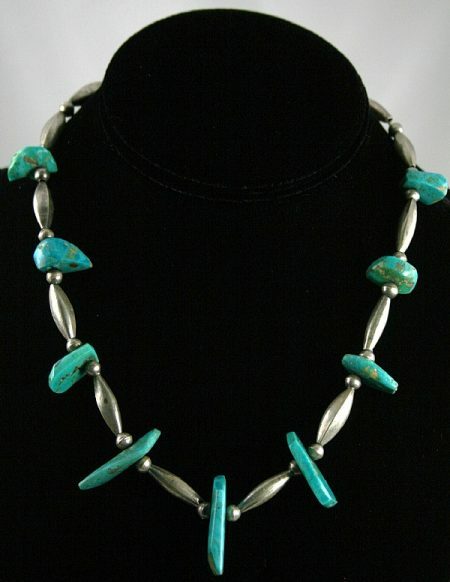 This beautiful piece features amazing Royston turquoise hand drilled nuggets interspersed with exquisite hand drilled and rolled beads. Each of the stones includes chocolate brow matrix and varies in hue between blue, dark and light green. An exceptional one of a kind collector's piece. 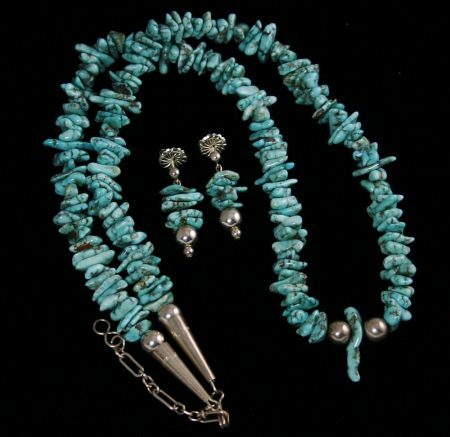 Beautiful circa 1930 Santo Domingo hand rolled and drilled three strand olive shell necklace set with fifty eight turquoise nuggets from the Royston turquoise mine interspersed with numerous spiny oyster shell pendants. 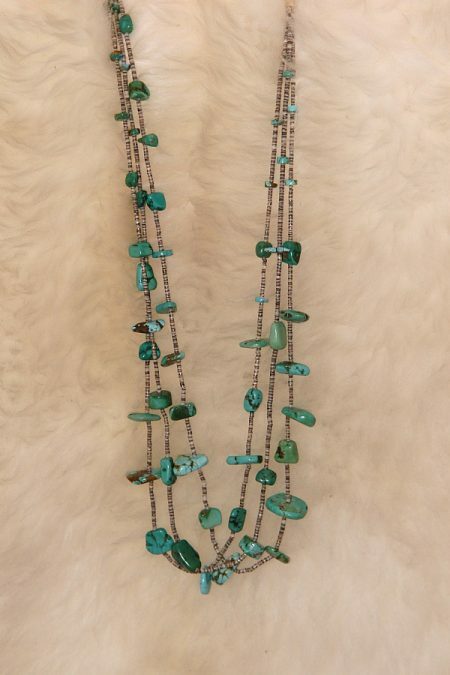 Gorgeous circa 1930 three strand Santo Domingo hand drilled and rolled olive shell necklace set with forty six turquoise nuggets, including rare Number Eight, Royston, and Battle Mountain turquoise. The stones vary in hue from deep green to light blue with brown matrix. Classic circa 1930s rolled and pounded squash blossom necklace set with a rare gem grade old Royal Blue turquoise cabochon. The stone measures 1/2 in. x 1/4 in.. 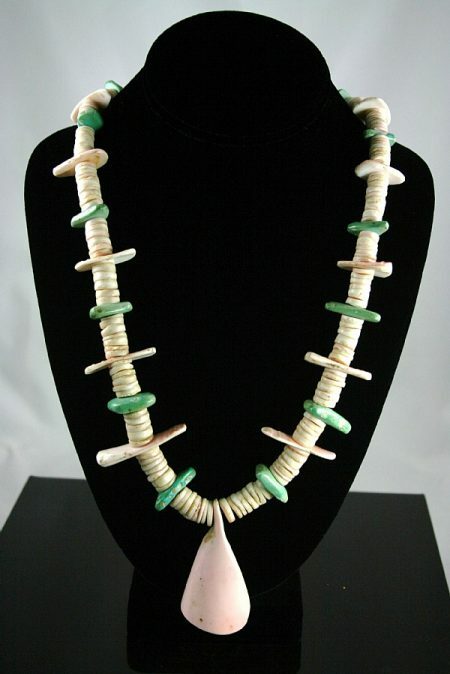 The beads and squashes are hand wrought with primitive hand made tools. An amazing eighty year old masterpiece. 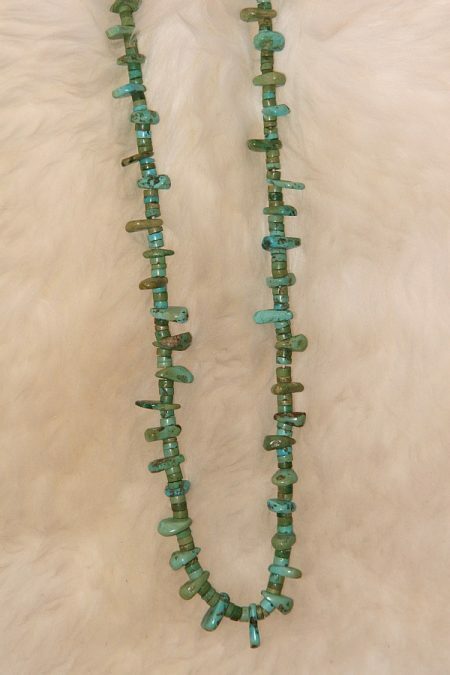 Beautiful circa 1930 three strand Santo Domingo hand rolled and drilled olive shell necklace set with numerous rare Lone Mountain turquoise hand rolled beads. 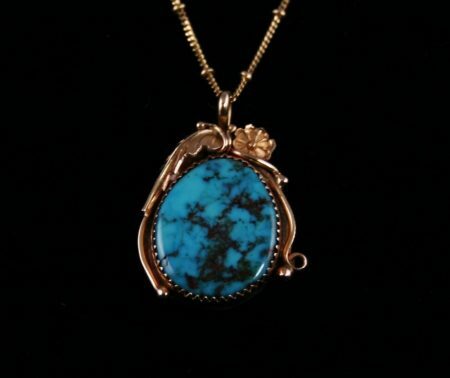 The turquoise in this piece is a gorgeous deep and light blue with chocolate brown matrix.